One of the two Dutch entries in competition at the 15th edition of the IDFA, this film investigates the present situation of the "Bushmen" in South Africa while simultaneously casting a spotlight on the past experiences of these people and their shifting place in a sociological world. As a result of the policies of South African president Thabo Mbeki, an attempt is being made towards creating an African Renaissance based upon reinforced black consciousness and including a special emphasis upon native cultures. In the past, the Bushmen tribes have, at different periods in time, not only been regarded as ape people and the vermin of their country, but also feared as children of the devil who possessed magical powers. Presently, they have become mascots of a new age. Tourists are enchanted (and willing to part with some change) to have their photographs taken alongside the descendants of these tribes. With the assistance of human rights lawyer Roger Chennels, the San (community made up of Bushmen and Hottentots) developed a strategy to win back forty thousand hectares of land south of the Kalahari National Park. 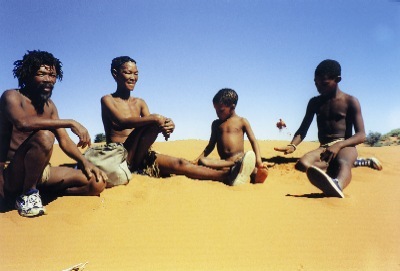 In 1999, the members of the Bushmen tribe were given territory to live on with the goal of allowing them to further pursue their traditional lifestyle as nomadic hunters. An association (consisting of a local authority) was set up to help them keep maintain the six farms that exist inside this territory. Such new developments did not come about without a struggle between different groups. A series of fascinating characters appear in this film and offer a partial understanding of what of both past and present mean to these people. Included among those seen are two aged sisters who, in their youth, used to be put on display as "wild Bushmen" and are now delighted to be able to reside in a house once owned by a white farmer. As one watches the various members roaming their own land, it is impossible not to notice how beautiful their figures seem, wandering around freely in the nature surrounding them. Director Saskia Vredeveld shows them framed by the deep reds and yellows of the desert and standing against the bluest of skies. One can easily understand how she came upon the title "Out of Eden".